Daylight savings time is, I think, one of those things that would seem completely incomprehensible to someone visiting us from other planets—or, for that matter, even someone from a country that doesn’t observe it. Yeah, twice a year, we arbitrarily readjust all the clocks by an hour. You know, just to keep people on their toes . It’s like some sort of bizarre ritual dance of the seasons. Daylight savings time may be one of humanity’s more complicated innovations, but the Gadgetbox aims to make things easy on you this week. So check out a one-stop shop for hygiene and reference materials, a way to keep your hands warm and your gadgets useful, and how to move a computer without turning it off. It’s happened to all of us at one point or another. You’re in the shower, dutifully shampooing, rinsing, and repeating, when the knee-bucklingly fearful thought suddenly strikes you: what’s the atomic number of Ytterbium? Come to think of it, how do you even spell Ytterbium? If only you’d bothered to spend the paltry $31 on a Periodic Table Shower Curtain, you wouldn’t have to dart, dripping, from the bathroom to try and dig up your high school chemistry book from under your bed. 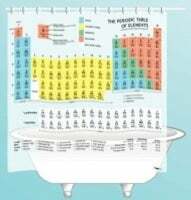 This 71” x 71” shower curtain is made from 100% environmentally safe EVA vinyl and features the periodic table, conveniently color-coded by element type (metals, nonmetals, metalloids—man, that would be a great name for a band—etc.). Plus, it beats the pants off the shower curtain you’ve got right now—seriously, that thing’s getting pretty grotty. And to sate your burning curiosity , I will remind you (for of course you only misplaced the knowledge) that Ytterbium’s atomic number is 70 and it’s a rare earth of the lanthanide series. Did I mention that the Periodic Table Shower Curtain is great for parties? You betcha. We have a saying in New England: “You don’t like the weather, then wait five minutes. By then you’ll have frozen to death, and it won’t really matter what you think any more.” Really: we’re known for our charm. Starting about now and lasting until roughly May, the weather in the northeast gets a mite chilly . Of course, if you’ve lived here for most of your life, then it’s nothing new. But over the last few years it’s gotten more inconvenient, as gadgetry starts to rely more heavily on tactile contact. See, when you’re wearing the thick gloves that winter requires, it gets awfully difficult to adjust your iPod’s volume. And let’s not even talk about the iPhone’s multi-touch interface. These Tec Touch gloves hope to remedy that by attaching a special “rubber nub” to the thumb and index finger so that you can easily punch a phone number or use an iPod’s Click Wheel without exposing your fingers to freezing winter temperatures. I’m not sure how well these things will work with the iPhone, but seeing as your other alternative is just not answering the phone while outdoors, it’s probably worth investigating. The gloves cost $30 and are available in M, L, and XL sizes in both black and brown. When it comes to glove technology, they’ve got a 100% nylon shell with a 45% nylon, 50% polyester and 5% spandex liner (and who doesn’t love spandex?). Of course, you could always try my other solution: don’t venture outside for the next six months or so. Hey, it worked for Howard Hughes, right? Moving a computer from one place to another without turning it off may seem like an impossibility, but it’s the kind of thing that law enforcement professionals need to do pretty frequently. And so the clever folks over at WiebeTech have devised the HotPlug, making the apparently impossible, well, easy . Provide the HotPlug with an independent power source, like a Uninterruptible Power Supply (UPS), and it’ll let you hijack the computer’s power source, whether that be a power strip or even a wall plug. You know what, never mind law enforcement: I can think of plenty of IT professionals who’d want a device like this too. 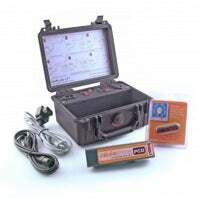 Heck, with it being this easy, it sounds like the kind of thing that everybody should have in their emergency toolkit, right next to a flashlight and that bottle of Jameson’s. The HotPlug runs for $500, though the accessory kits (for cases where you have to actually splice wiring) will cost you a couple hundred extra. They even throw in one of their mouse jigglers, a USB device you can plug in to prevent the computer from going to sleep. If you’re outside the US, you’ll have to pick up a specialized version that works with other types of plugs. Or you could just shut down your computer before moving it. But where’s the challenge in that? There you go: three ways to simplify your life with technology. Of course, let’s not ignore the flipside: next week, we’ll bring you ways to unnecessarily complicate your life. Hey, it’s what we do. See you then.